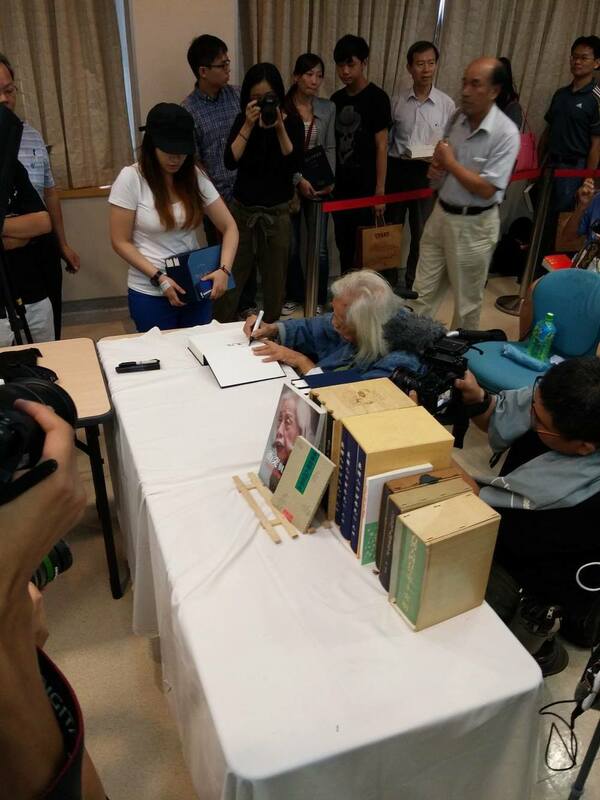 On August 31st Su Beng had a book reIease and book signing event at the National Taiwan University for the newly revised Chinese language version of his book THE TAIWANESE PEOPLE'S 400 YEARS OF HISTORY (台彎人四百年史) aka TAIWAN'S 400 YEAR HISTORY. Su Beng first wrote the book in Japanese and published it in Japan in 1962. Since then, there have been several versions of his book. It took him nearly 20 years to write the Chinese language version. As Su Beng was finishing up writing the Chinese language version of the book, he had to go into hiding to ensure its completion. Initially, he had planned to publish the earlier, first version (which was written in Japanese) under the nom de plume Su Beng. But the word somehow got out out, and as we now know, the name has stuck. For him, writing the book was not about the noteriety or any royalties. He simply wanted to create awareness. He believed that before the Taiwanese people could have a strong sense of identity, they'd first need to understand their own unique history. When the book came out during Taiwan's martial law era (1949-1987), it was immediately banned. And so the book circulated underground in a variety of "unauthorized" or "unofficial" forms. However some of these "unauthorized" copies were in fact authorized by Su Beng; he agreed to allow certain individuals to circulate the book underground. It is really quite wonderful to see a resurgence in interest in Su Beng and his book. Recently, Su Beng became much more visible and recognizable as he showed his support of the students and activists of the Sunflower Movement, who occupied the Legislative Yuan for 24 days in March and April. For some time, Su Beng has been asked when he'd be reprinting copies of the Chinese language version of TAIWAN'S 400 YEAR HISTORY. So it was time for a newly revised version of the book. I saw that Nicolas Jian had recorded a video of Su Beng's remarks at the event that day and posted it on Facebook. I wanted to share it on The Story of Su Beng Facebook page with an English translation of what Su Beng said, and Nicolas was kind enough to help me with the translation. Then I thought it would be good idea to share the video here and to put it up on YouTube. So I asked Nicolas about this and he was kind enough to agree to send it to me. Today there are many people here who haven’t gathered together before. I feel very touched. In the past when one talked about TAIWAN’S 400 YEAR HISTORY it was mostly discussed amongst people who knew each other. But today, of all the people here, there aren’t that many I recognize. I’m happy and touched to see this. If you tell me to only talk for 5 minutes, well I could talk for 50 minutes. 50 minutes still wouldn't be enough time for me to talk. I only have 5 minutes, so first let me talk about this book and the reason why I wrote it. The history of Taiwan has been written from the perspective of outside ruling regimes. During the Dutch occupation it was written from the perspective of the Dutch. During the Ching dynasty it was written from the perspective of the Chinese. During the Japanese era, it was written from the perspective of the Japanese. And then when Chiang Kai-shek came, it was from the Chiang regime’s perspective. I thought that this wasn’t right. It was as if the Taiwanese were nonexistent. They were ruled by others, oppressed and the natural resources of Taiwan were pillaged. Their (the Taiwanese people’s) history has been lost. So the main point of my book TAIWAN’S 400 YEAR HISTORY, was to write it from the perspective of an invaded colony. That’s how it all started. I only have 5 minutes. Another thing, now people are saying that the Taiwanese and Chinese are not the same; people have recently voiced this. During the occupation of the Legislative Yuan, people said this and it’s good. It took the Taiwanese about 100 years to be able to say that Taiwanese and Chinese are not the same. This is a good thing. Previously people couldn’t voice this, but now they have. However, how are the Taiwanese and Chinese different? Not everyone knows. If you don’t know why, when you discuss independence, you will end up retreating to your previous stance. Now the point is, how are the Taiwanese and Chinese not the same? Where/how did they diverge and become different? Simply put, about 200 years ago during the Ching dynasty, it was not the elites of the Ching dynasty that came to Taiwan. It was the Han from Fukien and Canton, who came and served as administrators. They couldn’t feed themselves in Fukien or Canton, so they immigrated from there (to Taiwan). They were the Han Chinese from Fukien and Canton. So one group of Han (the Ching elites) came, ruled, oppressed and pillaged Taiwan. The other (those sho immigrated) came and worked to the bone to make a living. You all have been educated by the Kuomintang’s education and books, which don’t explain any of this. Back then, there was already a distinction made between the local Taiwanese and Chinese. The ones who had (immigrated to Taiwan and) come to toil and clear and develop the land; they were called local Taiwanese. Those (Ching elites) who came for 3-5 years and went back (to China), they were called Chinese. At the time the locals resisted the Chinese and there was a saying, “Every three years an uprising, every five years a rebellion.” Every year there was some sort of an uprising. Why? For the Taiwanese to stand up for themselves, to reach for the sky and be the masters of their own fate. That the Taiwanese don’t know this is such a shame. Now, everyone knows that Taiwan and China are not the same. How are they different? You need to now how they are different. This knowing should not just be based on feelings or emotions. Knowing the difference should come from the society and theory. With Taiwan independence and Taiwan nationalism, people should not just approach them based on emotions. To understand them you have to have theory. If you don’t do that, realizing independence for Taiwan will become more out of reach. Taiwan will most definitely be independent, why? In our 400 years of history we have had a tradition of opposing foreign regimes. The (worldwide) trend is toward democracy, and the elimination of colonies. The only people who now have a foreign ruler are the Taiwanese. Only the 23 million people of Taiwanese are still being ruled by a foreign regime. Can everyone really just sit by and take it? I plead with you all to work even harder. Otherwise, even though we can achieve independence, the time to attain independence will grow even longer. I think I’ve spoken about 10 minutes already. This is what I have to say first. Later we can be at ease and talk about other things. Once again, a very SPECIAL THANKS to Nicolas Jian for sharing this video with me and for helping me with the English translation. It looks like Su Beng was kept very busy at the book release/book signing event! Several people spoke at the event, including Freddy Lim, lead vocalist of the heavy metal band Chthonic and chair of Amnesty International Taiwan. When I was in Taiwan earlier this year, I had a chance to talk to Freddy about Su Beng. Freddy told me that he regarded Su Beng as one of his mentors. Na Su-phok, one of the authors of 史明口述史 (THE ORAL HISTORY OF SU BENG) spoke as well. Tsay Ting-Kuei of the Alliance for Referendum of Taiwan made a few remarks. Professor Li Hong-hsi 李鴻禧, former Formosa Television political talk show host also shared a few words. At the event, university student Chen Miao-ting painted a portrait of Su Beng. It was quite a full day and Su Beng was so exhausted that after it all he had to go to the hospital for an IV drip! At the time of writing this blog entry, Su Beng has already gotten back to his busy schedule of talks and workshops around the island. Here are two news articles about Su Beng's book release event. The first is written in English. The second is written in Chinese.